Last night, when I got home I rushed to the bathroom to take my left contact out, since it’s been really bothering me since Monday, when I went to the bathroom on set at LOST and saw that I had blood red eyes. I looked in the mirror and saw a small thing on my eye and at first I thought it was a reflection, but when I turned my head side to side, it didn’t go away. I have a doctor’s appointment tomorrow, hopefully it’s nothing serious. I’m walking around with one eye shut, but really could use an eye patch. I figure this is great practice for applying to be an extra for Pirates of the Carribean 4, which is going to be filmed here in Hawaii this summer. ARRR! Shiver me bentos! 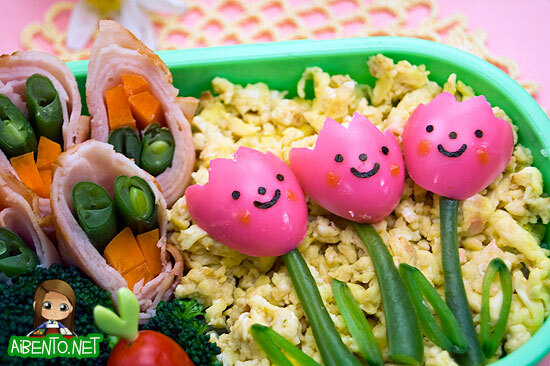 Today I have a bento of three smiling tulip friends with my crappy first attempt at a meat and veggie roll. 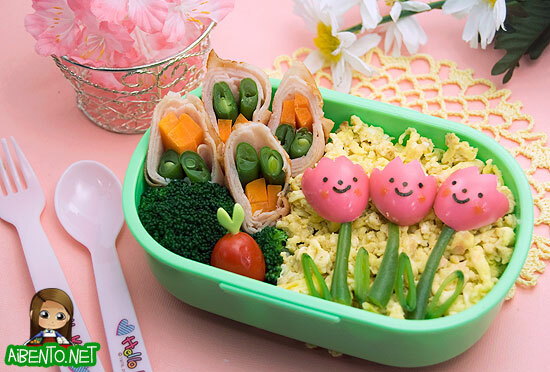 I came up with the idea for the tulips when I was looking for a previous post and saw my Ghosts of Quail Egg Past bento from Halloween. Turn those little ghosts upside down and you have tulips! I boiled and peeled two quail eggs, then soaked them in diluted neon food coloring. Once they were done, I cut them in half and cut the jagged edge out with a knife. Here’s a closer look at them. I used a punch to make the nori features, then put on ketchup cheeks. The stems are made from leftover pieces of green beans from the rolls and the leaves are sliced sugar snap peas. On the bottom I have brown rice and on the top, two scrambled eggs. I didn’t have time to add any seasoning, but I have a ton of soy sauce packets at work to use up and I’ll pour that on for taste. Here’s another shot with a better view of my rolls, though that’s probably a bad thing. I boiled the green beans first, then wrapped two with some carrot sticks in deli sliced turkey. I had to use 4 slices each to get enough turkey and then fried them in coconut oil cooking spray. You’re supposed to use something like chicken or pork, but I was too lazy and though the turkey might suffice. I’ve seen sushi in a book I have that has perfectly circular sticks of carrots. This totally boggles my mind. Do the Japanese have some snazzy carrot rounder that I don’t know of?? Do they just use a peeler? 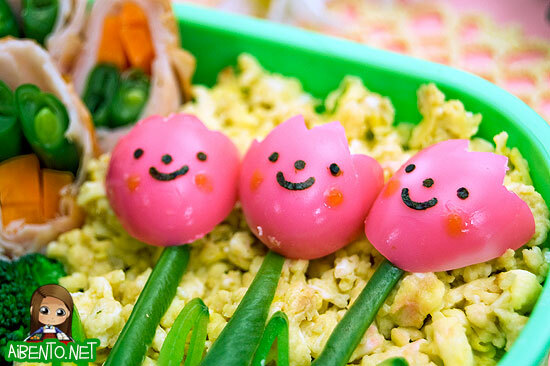 In other news, Amazon has updated the Yum-Yum Bento Box: Fresh Recipes for Adorable Lunches page with the book’s cover! Hopefully now that the image is there, people will begin pre-ordering and the book’s popularity will go up. Also, yesterday marked the end of the Haiti Fundraiser that Susan Yuen and I are running. I will be drawing the winners tonight and announcing tomorrow, along with our total amount raised. Thank you everyone for making it such a smashing success! !